In a changeup from the SEC schedule the Gators head to Fort Worth, Texas to take on the TCU Horned Frogs on Saturday in the Big 12-SEC Challenge, a chance for two elite leagues to battle it out for supremacy. Coming off what was a sloppy, yet inspiring effort for the Gators to beat Texas A&M at home they now get a chance to pick up what would be their biggest win of the season at TCU. Desperately needing resume wins the Gators will have plenty of chances within the league but given the strength of the Big 12 a win over TCU would age like a fine wine and really help them out on Selection Sunday. Given the fact that TCU isn’t a regular opponent I took a look at some film and checked out the numbers to see what the Gators can expect from Coach Jamie Dixon’s squad. TCU is 14-4 on the year but three of their losses have come in the last 5 games once conference play started. They didn’t have a challenging non-conference schedule and knocking off USC and a talented Fresno State team were their only notable wins. In the loss column is a 73-64 loss at home to Lipscomb, a really good mid-major team but one I’m sure TCU thought they could beat. Fast forward to conference play and they beat Baylor before falling to Kansas and then Oklahoma, a team we know all too well is pretty good. They then crushed West Virginia by 29 before losing to Kansas State and then beating Texas which brings us to the present. I’m not exactly sure what’s going on with the TCU program but despite having a pretty good season on the court so far they have had four players, that’s right, FOUR players leave to transfer since the start of this season. Jaylen Fisher (a guard plagued with injuries), Yuat Alok (who was one of the most desired JUCO transfers this past offseason), Kaden Archie (a top-100 wing Florida had interest in), and Angus McWilliam (a New Zealand-born big man) have all decided to find homes elsewhere and it has left TCU’s bench looking awfully thin. It hasn’t been made clear why this mass exile has occurred and no one knows if they are related but it certainly comes across as strange. Florida is a team that has been depleted by injuries so this will be a matchup of two teams missing pieces in their rotations. The Fisher injury/transfer has hurt them the most and this is a chance for the Gators to pounce on a depleted roster still figuring things out. Alex Robinson is a senior point guard who is one of the most fun players to watch in the country with his wild passes and creative shot attempts. Currently averaging 13.3 points and 7.9 assists (!) per game he makes a lot happen for the Horned Frogs. That assist number is particularly impressive and though he is prone to a lot of turnovers (3.5 per game) his ability to create shots for his teammates is astounding. Florida is second in the country at forcing turnovers with their defense and Robinson is a guy they’ll have to try to influence into some mistakes. In his last 5 games he has had 24 turnovers (which coincides with when backcourt mate Jaylen Fisher transferred out) so he’s coming into the matchup with Florida on a streak of sloppiness with the basketball. Stopping Robinson could mean stopping a good deal of TCU’s offense so I think he’ll be one of the major players on the scouting report. The other player to keep an eye on is Desmond Bane, a strong wing player who does a little bit of everything while averaging 14.9 points, 5.7 rebounds, and 2.9 assists. If the ball isn’t with Robinson it’s probably with Bane and while Robinson is a bit more flashy Bane is more of a player who gets it done on the inside with great finishing ability. He’ll be an interesting matchup on the wing for the Gators as they try to stop both him and Robinson from wreaking havoc on the perimeter. Right after Florida had their best three-point shooting game of the season against Texas A&M they now have to go against TCU who happens to be one of the best teams in the country at defending the long ball. The Horned Frogs are 9th in the country in 3-point percentage defense at 27.7% and they are great at limiting 3-point attempts as only 34.2% of opponent’s field goal attempts come from 3, good for 47th in the country. On the other side you’ve got a Gators team that takes 45.9% of it’s shots from behind the arc and relies on the 3-point shot for 40.4% of their total points. 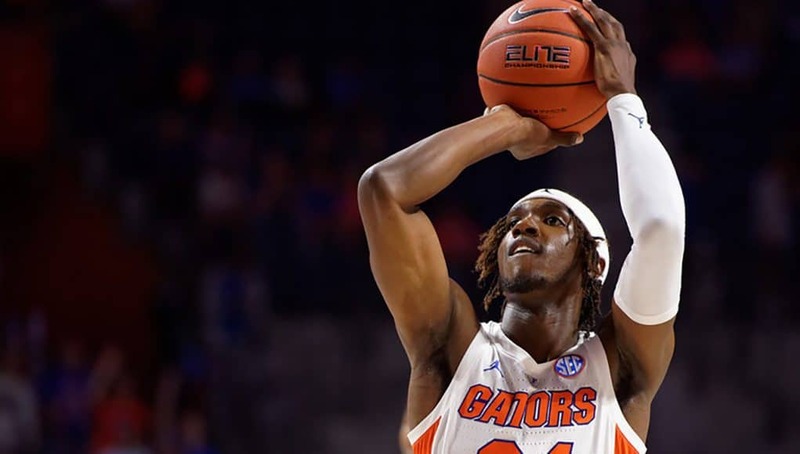 This could be a challenging situation for the Gators, especially on the road, as their offense relies heavily on the three-ball. TCU is going to work extremely hard at running the Gators off the line and when they do the Gators will have to be able to make reads and make plays. Scoring at the rim definitely has not been a strength of this team and TCU’s defense is designed towards forcing teams to try to score inside which could really challenge the Gators. This will definitely be a storyline to watch for on Saturday as you have a team in Florida who wants to get off as many threes as possible and a TCU team that’s trying to limit those shots to the best of their ability. This game could definitely swing on whether or not the Gators can get open looks from deep. After having what was likely their worst defensive effort of the season against Texas A&M the Gators will have to defend better against what’s a really efficient offensive team in TCU. The Horned Frogs pass the ball really well and are great at generating looks near the rim (similar to how Tennessee plays) and without a lot of beef inside the Gators are going to need to keep the ball out of the paint. That is definitely an area of concern, as well as the fact TCU is so good at defending the three-point line. It’s going to be tough for the Gators to make 18 threes like they did against Texas A&M so they’ll have to have a better diversity of ways to score on Saturday. TCU is going to challenge them to score at the rim and that has been a challenge for the Gators. Generating turnovers is going to be a key for them and they could have a field day against Alex Robinson. Getting transition opportunities after steals could be of utmost importance given the way TCU defends in the half-court and I think the Gators need to be able to run if given any opportunity. This should be a challenging game but one that gives the Gators a chance at a great win. Gator signees Scottie Lewis and Tre Mann were announced as McDonalds All Americans this afternoon giving Mike White his first players with that honor in his career. Lewis was considered a slam-dunk to get this honor while it seemed like Mann was a little bit on the bubble and seeing him get in is awesome and a great recognition for how much his game has come along. Getting two McDonalds All Americans is great for Florida’s brand nationally and should make you very excited for the future.